← A cool new cave site near Tumbler Ridge? In situ salmon vertebra at the Upward Sun River site, Alaska. Photo: Ben Potter. My first reaction on reading that these were Chum salmon (Oncorynchus keta) was “no way, that species only migrates upriver a few tens, or maybe a hundred kilometres. Certainly not well over 1,000 km from saltwater”. Turns out this is true for most Chum salmon, but the Yukon River Chum do run that far upriver – this site is near the uppermost range they reach on the system. So Chum is certainly plausible. My second reaction was, “How do they know it is Chum?”, since salmon remains are notoriously difficult to tell apart – that is, it’s hard to tell a coho vertebra from a sockeye, etc. Turns out that they used ancient DNA extraction to verify these remains as Chum salmon. Well, when I say “these remains”, it appears they extracted DNA from two specimens from a total of over 300. They tried three, but had success with only two (fairly miraculous to have any success at all, really). This low sampling density is a little puzzling. At least one sample aDNA ID was replicated in an independent lab. The dates seem tight and the components are well defined and there are other fauna and artifacts galore. To further solidify these as anadromous (marine fish which run up rivers to spawn) versus (I suppose) potentially landlocked Chum of some kind (analogous to landlocked sockeye, also known as kokanee), they performed stable isotope analysis on the specimens. They were able to convincingly show these were fish that spent their lives in a marine environment. I mean, I don’t think there are any known landlocked Chum, but perhaps there were in the past? It’d seem aDNA would settle it but it’s good to see them go the extra mile. The early dates are quite exciting. This is in the heart of Beringia, where some models of the early peopling of the Americas would have us believe the big game hunters responsible for killing off the now extinct American megafauna originated. Fishing is pretty manly in my books, but is not commonly associated with the hyper-manly “PaleoIndian” period. Well, there’s not much evidence for fishing then, but since fish exploitation is known for literally two million years, it’d be safe to assume it was in the capabalities of Homo sapiens. Sometimes I get the impression that we think of Beringia as a giant culture-eraser, so the early people of the Americas must be shown all over again to have basic adaptive skills which are well established all over Eurasia for tens of thousands of years. Like, archaeologists think they lost their well-established Upper Paleolithic skillsets and had to start all over again. Watercraft is another that comes to mind. Maybe it’s less scientific or something, but wouldn’t we be further ahead if we had just assumed people 10-15,000 years ago in the Americas were familiar with boats? OK, I digress. My slight quibble is not that this isn’t a fantastic and important site for understanding early North American archaeology. Rather it’s around terminology. If the Pleistocene is understood as ending at the end of the Younger Dryas interval, caa. 11,700 calendar years ago, then are these actually Pleistocene? Not quite, perhaps. However, if, as is common, we use 10,000 calendar years as a convenient shorthand for the end of the Pleistocene, then there other sites bearing salmon or salmon-related that qualify. Just off the top of my head, there were trace amounts of salmon at Kilgii Gwaay (10,700 years ago), and in hearths at Richardson Island dating to between 10,000 and 10,400 years ago. In fact, 25% of the hearths at Richardson contain calcine salmon (Steffen, MA thesis). Both sites are in Haida Gwaii. If memory serves (and it’s too late to put my scotch down and waddle across blog headquarters to check) the Milliken site on the Fraser has basal dates of about 9,200 years 14C, or about 10,300 calendar years, or so? The location of this site in the midst of prominent salmon-rich eddies at the base of a steep river canyon makes little sense except as a salmon fishing station. And I think there were charred seeds indicative of fall occupation there as well. So despite the lack of salmon bones it’s a fairly safe inference. Anyway, it’s all terminological I guess – it’s the age it is, even if the label is arguable. If I had to, I’d choose the end of the Younger Dryas cold interval as the true end of the Pleistocene, so these remains are indeed very close to that age. I was also a little surprised at the lack of comment on the context of these salmon remains. It appears they are sandwiched between and amongst two burial features, including three individual children, none older than age four. In fact, the context for the salmonids is described as “cremation hearth” and “burial pit fill”. Maybe the significance here is not just eating salmon, but ritual deposition of salmon in mortuary practice? It’d be nice to see this discussed head on. In an earlier paper (Potter et al. 2014) a variety of grave goods and ritual treatment of these dead children is described. However, the salmonid remains (as then known) were described as being incidental to the burial contexts. I mean, I’m not going to second guess the assignments of association from my sofa, and certainly not those of Ben Potter! However, my point is, the ritual use of food in funerary ritual is extremely widespread. Whether we consider these food remains to be just functional as foodstuffs, or implicated in a bigger system of meaning, affects how we think about, and therefore research, these early inhabitants. If we don’t explicitly acknowledge spirituality, or demand unequivocal evidence for that which may always be equivocal, (and no mention of this in the new paper) it may skew our research. Just as if we don’t allow these people the skills to catch fish, small game, or use plants we may not even attempt to recover microfauna or archaeobotanical remains. Infant (less than five week old) burials at the Upward Sun River site. 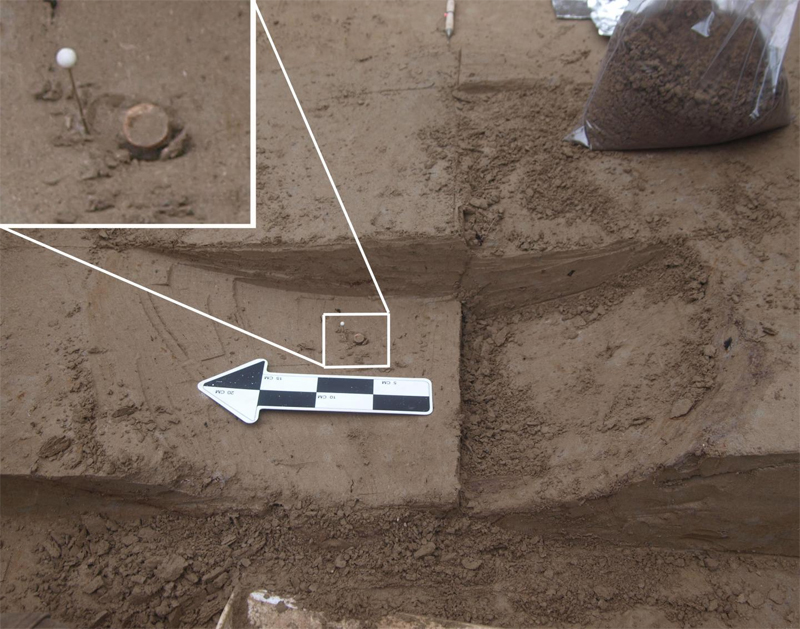 Note the remains are smaller than the spear foreshafts placed as grave goods. Sort of heartbreaking. Source: Potter et al. 2014 PNAS. Halffmann, Carinn et al, 2015 (preprint – institutional access only). Early human use of anadromous salmon in North America at 11,500 y ago. Proceedings of the National Academy of Sciences, in press. Ben A. Potter, Joel D. Irish, Joshua D. Reuther, and Holly J. McKinney 2014. New insights into Eastern Beringian mortuary behavior: A terminal Pleistocene double infant burial at Upward Sun River PNAS 2014 111 (48) 17060-17065. 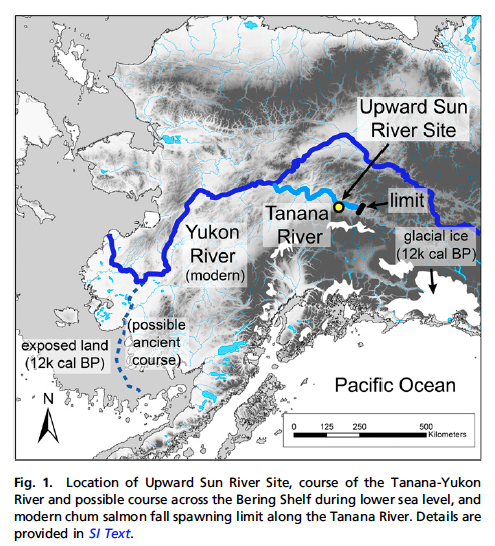 This entry was posted in alaska, Archaeology, Northwest Interior and tagged alaska, Beringia, first peopling, fishing, salmon, Tanana River, Upward Sun River, Yukon River, zooarchaeology. Bookmark the permalink. Thanks for the review, Quentin, and in your appreciation of what we accomplished. We’re thinking in similar ways about these broader assumptions people have had about Paleoindian behavior. You mention a few quibbles, and II think I can address some of your points here. Regarding the terminology question: I agree with you that I would certainly not consider the Pleistocene/Holocene transition to end at 10,000 cal BP, we follow Muscheler et al. (2008) and others to end about 10,000-10,050 C14 yr BP (or about 11,600 cal BP, not 10,700). The multiple ages (within both features and capping the feature) all overlap and average 11,600-11,270, certainly at the Pleistocene/Holocene transition, hence the term Terminal Pleistocene. Of course, there are many ambiguities about pinning precisely the end (and beginning) of the YD (e.g., Finkenbinder et al. 2015 QSR). A 10,000 calendar year (~8900 C14 yr BP) cutoff would be inconsistent with the geological and paleoclimatological literature, and while the early Holocene sites you mention are certainly important, they do postdate USR by at least a millennia or so. As we note in the paper, there are only about 6 unburned specimens, we destroyed 3 of them to get these results. Morphologically, all but a few specimens are Oncorhynchus, and all are morphologically similar to each other, suggesting that they are the same taxon. I’m glad you noted the tightness of the dates and component delineation – these are as tight as C14 dating can allow, and the component integrity is demonstrated by a variety of datasets (published in various venues over the years). The question of anadromous salmon is critical, as we have no idea of the life histories of these early interior salmon, as there were no samples prior to these. Because there is clear evidence of landlocked salmon, having only the DNA identification would still leave ambiguity. Chum salmon have been raised to maturity in freshwater, so we know they have the biological capacity for freshwater residency. With respect to assumptions about boating technology, fishing, etc., we can hypothesize, and even base models on existing foragers, which differ in many respects from our understanding of ancient foragers; but, ultimately we require the data to definitively test our models. We note in the paper we cannot at this point identify the nature of the fish exploitation (e.g., storage), but we are actively working on other avenues that will definitively address those and related questions. We don’t feel comfortable assuming that resources that might be available were actually used by an ancient population. There are numerous ethnographic and archaeological examples where this is the case. And again, emphasis is important. For instance, we know caribou were present in central Alaska during the late Pleistocene – however, they were less economically important than bison and wapiti (Potter 2008, Radiocarbon). We are with you in that we suspect that early diet breadth is wider than typically assumed. With respect to “lack of comment on the context of these salmon remains”, we hoped we were clear in our 2014 PNAS paper and this one. Given the 3 dimensional distribution of the remains, which were nearly identical in species richness to the cooking hearth (i.e., similar proportions of ground squirrel, hare, as well as salmon), and their condition (some were burned), these patterns clearly point to the fill as fill. 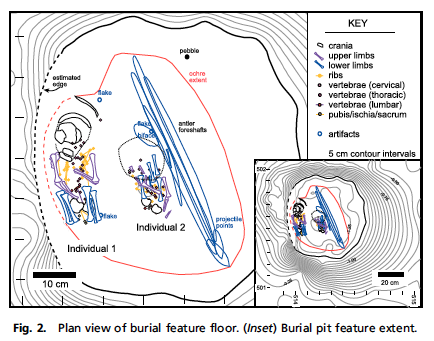 There were no fish bones or anything else in the actual burial except what we reported in PNAS last year (i.e., 2 infants and associated grave goods in a clearly defined layer of ochre). From my perspective at least, I support your concerns in the last paragraph. We (the authors) do not argue (nor have we ever argued) that any ancient population did not have skills to capture any resource. However, we must provide evidence to clearly document that certain suspected resources were in fact captured, which is what we did in this most recent article. First, we must demonstrate that the resource actually was present in the landscape under consideration, which was one major point of the paper. I also concur with you that any archaeologist who is not attempting to recover microfauna or macrofossils is simply not practicing good and ethical archaeology. Hi Ben, many thanks for your detailed reply and clarification. It’s like my blog just got peer-reviewed, revise and resubmit! My reading comprehension must have been hidden behind the scotch, I missed that the large majority of the salmon bones were calcine and therefore not suitable for aDNA purposes. Can stable isotopes analysis be applied to calcine bone, I wonder? I see where it is possible to 14C date it now, in many cases, we’ve done some of that ourselves recently. I’m with you on the rational definition of the Younger Dryas, not the convenient one, but the convenient one is fairly widespread I’d say and a lot of people use it as a casual ballpark number when asked. The Gaadu Din salmon you cite is paleontological but definitely salmon and definitely Pleistocene (honest to god), and your guys’ paper is making us think that might need to get that out there as an interesting assemblage in its own right. N is several thousand and all 20ish samples submitted for aDNA delivered sequences. Mostly one species but then I don’t want to spoil the surprise…. It’s good to get clarification on the bone context. I mean, it reads like the human burials are in a ?mortuary hearth which also contains burnt salmon? It’s interesting where one draws the line. I mean, in a late Holocene context down here in Salish Sea, I think that would be interpreted as “food for the dead”. But then we also don’t have such high res stratigraphy in shell middens, usually. And a lot more confidence in ethnographic analogy of that practice for a late period setting. Anyway. I was just unleashing a mild version of my rant that often the earliest people in the Americas are treated as Xs and Ys in models, lacking culture except for what we explicitly assign them. Wrong place to discuss it really since Upward Sun is one of the few sites which actually does have evidence for the inner life of these people. Anyway, renewed congrats to you and your team on a great project. 2) death of the two infants and burial through the center of this hearth, with backfill incorporating small amounts of fauna spread throughout (i.e., not concentrated). Interesting, that while salmon were part of a broad diet represented at this site, large hunting weapons were considered culturally significant enough to place within the burial). 5) possible burning of the structure, but certainly abandonment (the human remains are the highest part of the heath, and no faunal elements (i.e., food) lay stratigraphically above them). Hope this clarifies the complex mortuary treatment given to these three individuals. Thanks again Ben, it’s great to have the PI pop by the blog and clarify key points. It sure sounds like an unusual feature – like, it was used as a hearth, then as a burial, then as a hearth again, then as a burial again – but hearth and burial uses not related to each other. Very cool. And I just remembered the pendants, so will post something about them in the weeks to come. It is great to see such finely-stratified materials coming out of interior Alaska (is this loess sediment?) and with such care and attention. I’m struck by the huge advances that have been achieved in concepts around the early people of the Americas even over my career. It was 1968, just one year before I started to be involved in BC archaeology, that Charles Borden published his “Pasika” phase article. This is a good example of an archaeologist who thought the early people had “lost their well-established Upper Paleolithic skillsets and had to start all over again”, when he posited a culture with closer ties to the Oldowan than the upper palaeolithic. I have a vestigial memory that Mike Rousseau gave a paper re-interpreting the South Yale site expression of “Pasika Complex as an early-middle Holocene relict channel of the (then-higher-elevation) Fraser River, and he came to the conclusion that the “Pasika Complex” was a specialized salmon fishing site at this crucial fishing location at the lower entrance to the Fraser Canyon. So, full circle back to the . Namely, if I recall correctly, the preponderence of choppers was taken as evidence of (a) cutting wood for drying racks and fishing gear and (b) these were also cores for making cortex spall tools. The cortex spall tools were themselves used for filleting and processing salmon. I believe a blog regular has commented before that cortex spall tools were used by some First Nations women processing fish in the early historic canneries. There’s been more work on Pasika since, yeah? Mitchell & Pokotylo ca 1996 in that Early Human Occupation of BC book comes to mind (Carlson and Dalla Bona). Sean Haley (sp?) thesis? Anyway, I may be remembering this wrong, so students don’t cite me on this. Well, that’s a pretty good rule in general about anything of course. And yes, good point about Pasika being intuited as a very early occupation because it looks very “crude” when anomalous assemblages like this may be special function or seasonal poses. Kilgii Gwaay comes to mind – 10.7k cal BP, essentially no bifacial technology, lots of flake tools and unifaces. Yet current thinking on that is more or less that it’s a summer expression of the same archaeological culture type (Kinggi Complex) as seen at Richardson Island, 10.5k cal BP, which is full of bifacial technology in addition to a Kilgii-like assemblage (more or less). Richardson is most likely a sheltered winter time site, containing salmon and close to Karst caves. “No need” for bifaces in the summer when hunting sea mammals and trapping bears, and fishing of course. A bit too simple, but you get the idea — a sort of “totalizing” effect can take hold where we look at the characteristics of an archaeological “culture type” known from multiple sites and then totalize that into a single tool kit that was never actually used all at once in any one time or place. Oh man I love the sound of my keyboard clicking, a little too much lately.